A simple 'Corniche' shape carriage clock with push repeat on demand and striking on a soft gong. 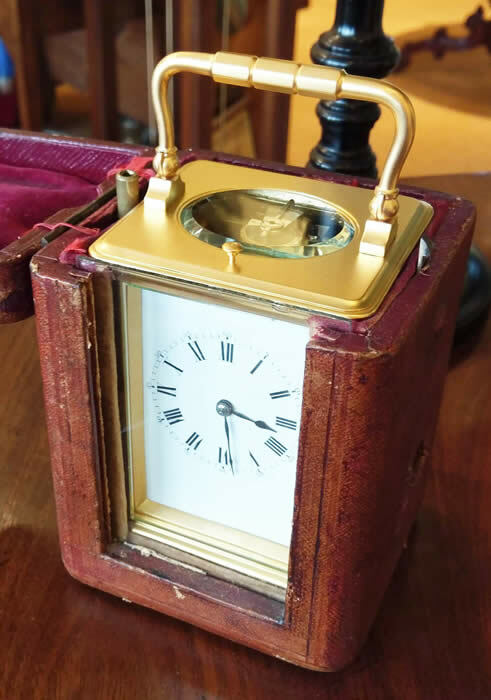 A super quality gilt case with bevelled 'sight' to the dial and multi piece base. The dial displaying Roman numerals with smaller outer minutes and in perfect condition. The original hands, the original escapement. The original outer leather case and key. Numbered 22543 which is a Drocourt serial number and has all the hallmarks of Alfred Drocourt with the 'Arrow' for hand setting and dates to 1900-10. Sold fully guaranteed for 2 years. A very reasonably priced clock and would make an ideal gift.